Today, I am excited to introduce Larissa from Just Another Day in Paradise. I simply love her blog. I have been following it for awhile now, and I feel like if I met Larissa in person we would be good friends. I love her taste in crafts. She shares great recipes....and well, we both have 3 cute boys. She makes you feel right at home while you read and I simply love that. Hey Creation Corner Readers! I am so happy to be over here today celebrating Spring with you all. I spend my time mostly being a Momma to three Little Men. 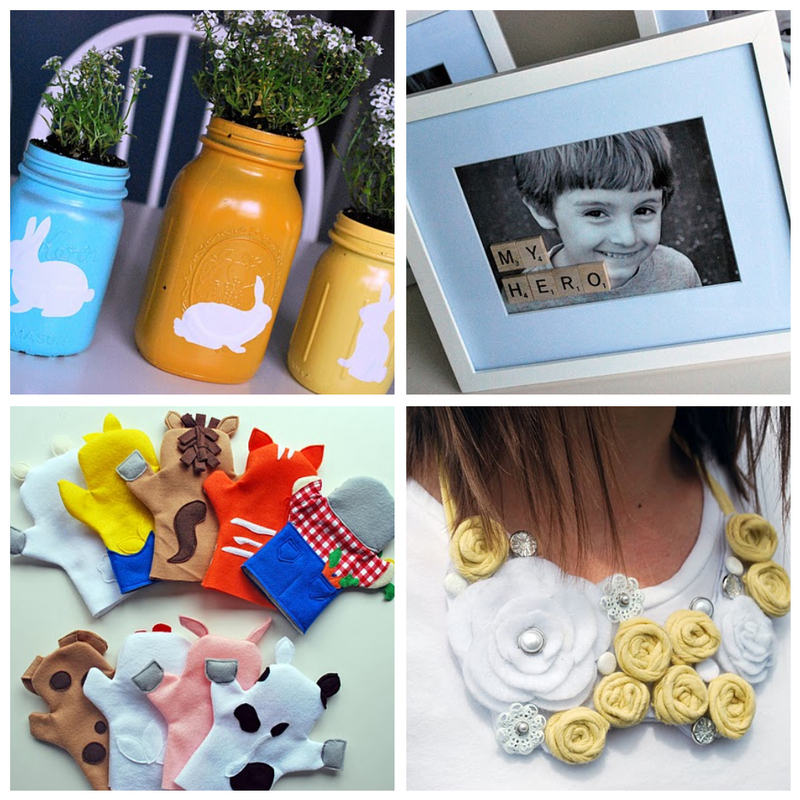 When I need a creative break I sew, craft, paint, decorate, cook, and plan a party or two. One of my two favorite times of year is Spring. Everything is so fresh and brand new. Sweater and jeans can be put away. T-shirts and skirts can come out. I am totally a skirt wearing girl. 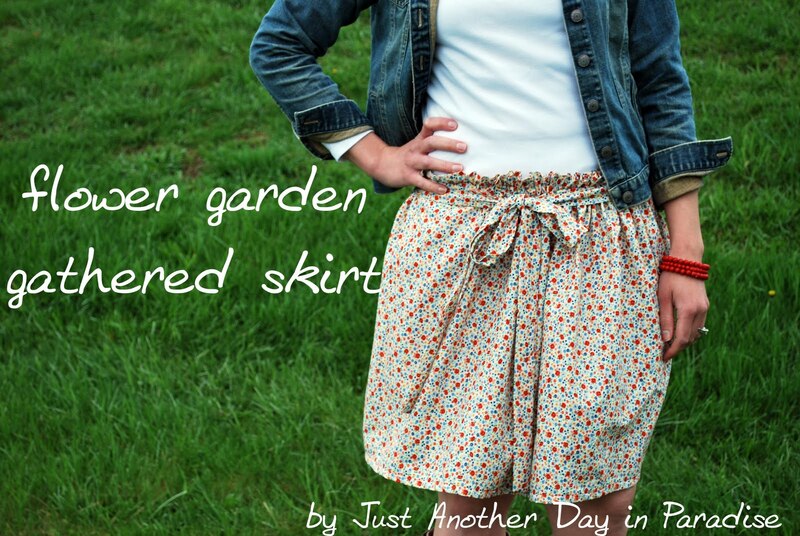 So with my love of Spring and skirts I decided to share an easy skirt tutorial with you today. 1. Measure your waist, or where you want your skirt to hit. 2. Cut two rectangles of fabric, each measuring the width of your waist plus 1", and how long you want your skirt plus 4 1/2". 4. Sew the two rectangles together, right sides facing with a 1/" seam allowance. Making a giant tube. Press seams. 5. For the hem of the skirt, press the fabric up 1/2" all the way around the bottom of your skirt. 6. Fold up another 1/2" and press all the way around the skirt. 7. Turn right side out and sew your hem in place, about 1/2" from the edge. Press. 8. For the top hem, start by folding and pressing in 1/2" all the way around the top. 9. Next, fold over again, but this time 2". Press as you go all the way around the skirt again. 10. Sew hem in place first about 2" from the top edge making your stitches are securing the hem. Leave an opening in your stitching between the start and finish. This will be where you insert your elastic. Sew another line of stitching 1 1/2 inches from the first line of stitching. This will be the casing for your elastic. There is no need to leave a hole in the stitching for the top stitching. 11. Take your precut elastic and pin a safety pin in one end. While holding on to the other end, feed the elastic through the casing . 12. When you are all done, pinch the ends of the elastic together and remove the safety pin. 13. While holding the elastic together, feed the ends through the machine and secure with a zigzag stitch. 14. Bunch and gather your skirt evenly. 15. For the waistband, iron strips in half. 16. Stitch along one of the short edges and all the way up the long open edge. Repeat with the other strip. 17. Turn out both strips. Press. 18. Sew the two strips together at the ends where you turned them out (aka the open ends). This will make a long belt type piece. 19. Pick the back of your skirt. Locate the middle and pin the center of the belt you just sewed to the cent of the back. Sew a single line from the top of the band to the bottom attaching it to the back, kind of like a permanent belt loop. Pulling the belt somewhat tight, pin the belt in place along each side seam. Sew in place,again like a stitched belt loop. Now you just need to put on your lovely Springy skirt, tie a marvelous bow in the front and put on a pair of sandals...unless you are me and are in the middle of Spring downpours, then pair it up with a pair of boots and a jean jacket. easy tutorials and fun things to share with you. giving me a good reason to make myself a new skirt. What a sweet skirt! Thanks for sharing, Larissa & Tasha.